The DeKalb County Community Foundation's commitment and support to workforce development is made possible by 20 CommunityWorks funds, generating over $100,000 annually. Learn more about CommunityWorks. The CommunityWorks Workforce Development initiative goal is to enhance soft skills education for DeKalb County middle school and high school students, while working to improve employer participation in youth workforce preparation. 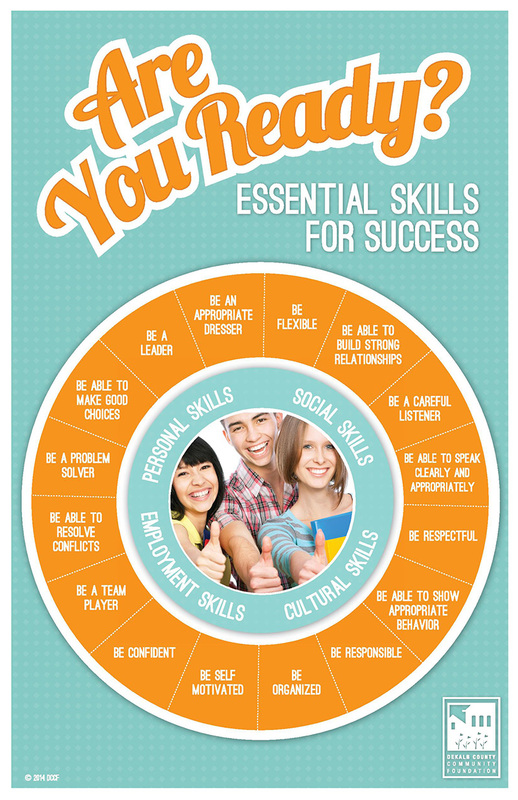 Soft Skills complement hard skills which are the occupation requirements of a job and many other activities. The DeKalb County Community Foundation has been working with middle school educators to promote sixteen specific “soft skills” identified as lacking in the emerging workforce. As a result, Community Foundation developed and copyrighted the Skills for a Successful Future Wheel and distributed it to area schools and programs impacting middle school youth. The Community Foundation is working with the DeKalb-Ogle Workforce Development Consortium and DeKalb County Economic Development Corporation to enhance soft skills within DeKalb County schools through the Industrial Workforce Coordination Pilot Program. The CommunityWorks Workforce Development initiative is currently accepting soft skill enhancement grant applications. For questions or more information, please contact Community Engagement Director Teri Spartz at 815-748-5383 or t.spartz@dekalbccf.org for assistance.